As part of the Teach Reconstruction campaign, we offer two lessons, Reconstructing the South: A Role Play by Bill Bigelow and When the Impossible Suddenly Became Possible: A Reconstruction Mixer by Adam Sanchez and Nqobile Mthethwa. We want to hear about your use of these lessons. 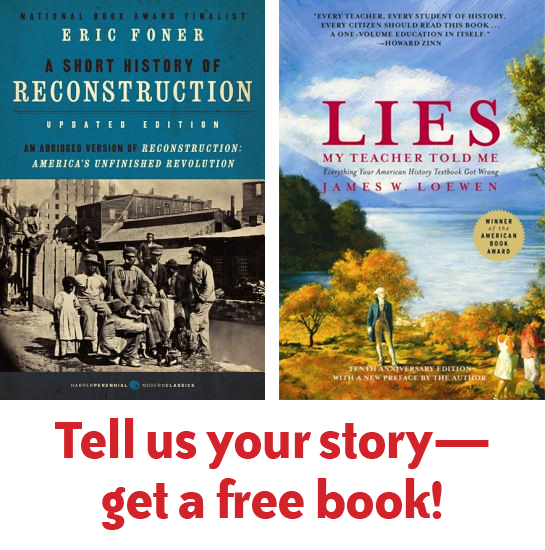 In appreciation for your time, we will send you a free copy of A Short History of Reconstruction by Eric Foner, thanks to a donation from HarperCollins or a hardback copy of Lies My Teacher Told Me (2007) by James W. Loewen, thanks to a donation from The New Press. Use the form below to let us know the impact of using Reconstructing the South: A Role Play and/or When the Impossible Suddenly Became Possible: A Reconstruction Mixer in the classroom. “…an extremely convincing plea for truth in education.” —San Francisco Chronicle about Lies My Teacher Told Me. About the lessons: Reconstructing the South: A Role Play engages students in thinking about what freedpeople needed in order to achieve—and sustain—real freedom following the Civil War. It’s followed by a chapter from the book Freedom’s Unfinished Revolution on what would happen to the land in the South after slavery ended. When the Impossible Suddenly Became Possible: A Reconstruction Mixer is a mixer role play that explores the connections between different social movements during Reconstruction. Read some of the comments we’ve received to date from teachers across the country.